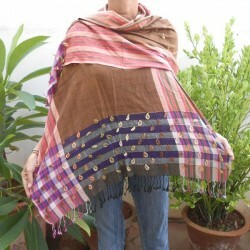 Indian scarf, 86.61 x 28.35 in, cotton and viscose, curls, olive green, purple and dark red. Yellow orange Benares cotton scarf with Buddha and Hindu red design printed, handcrafted in India. Yellow Benares cotton scarf with Shiva and Hindu red design printed, handcrafted in India. Indian scarf, 86.61 x 28.35 in, cotton and viscose, curls, dark blue / turquoise. Light brown Benares cotton scarf with Ohm symbol and Hindu red design printed, handcrafted in India. Brown Benares cotton scarf with Ganesh and Hindu black design printed, handcrafted in India. Indian scarf, 86.61 x 28.35 in, cotton and viscose, curls, maroon, purple and blue. Yellow orange Benares cotton scarf with Ganesh and Hindu red design printed, handcrafted in India. 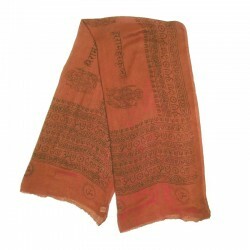 Light brown Krishna cotton scarf with red Hindu text design printed, handcrafted in India. Yellow-orange Benares cotton scarf with OHM and Hindu red design printed, handcrafted in India. Purple Benares scarf cotton with black Ganesha and Hindu text design printed, handcrafted in India.